It’s just over a week since we got back from France. Blog commenters were incredibly helpful when we were getting ready to go, so I wanted to let you know how it went and what we learned. Hopefully if you are ever planning a holiday to France, some of the information in these posts will be useful to you. 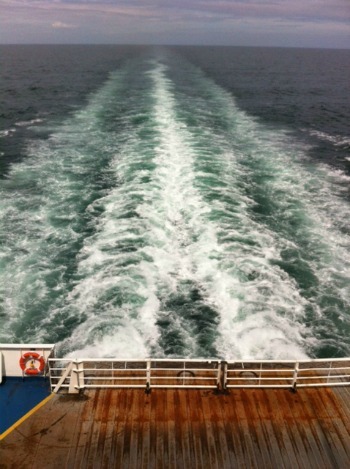 Today we’re looking at the realities of visiting France by ferry and car. Our journey to France started with a 5am wake up call to catch the Brittany Ferries boat Normandie which was leaving Portsmouth for Caen at 8:15am. 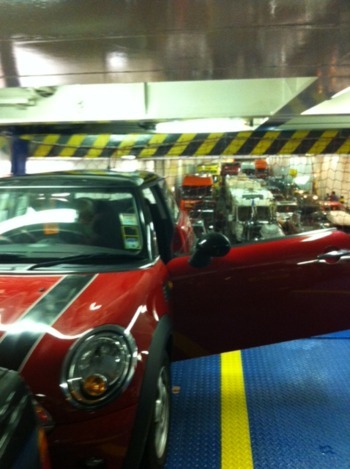 This end of the journey was incredibly smooth – we just turned up and rolled on to the boat, leaving the Mini safely tucked in behind hundreds of other vehicles. 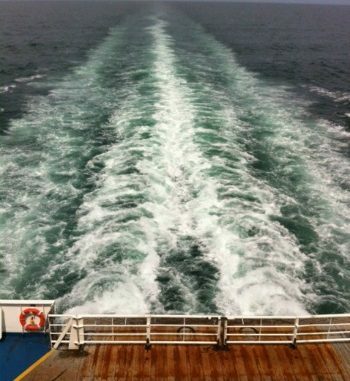 The big eye-opener for us was staying in a cabin, which Brittany Ferries had arranged as part of the journey. 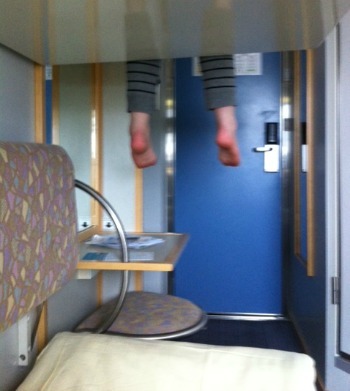 Seriously, book a cabin, they are ace. It makes normal ferry journeys seem like hanging around in a bus station all day. It’s only about £30 extra but it makes a huge difference to how you feel at the end of the journey. Even if the boat’s bobbing up and down a lot, it’s so much easier to cope with when you can lie down. The cabins are compact and functional, and include four beds, an ensuite shower and a loo. Cabin interior. Feet not always included. The staff of the Normandie were clearly working hard to make the journey a pleasant one, especially for younger passengers. There were children’s entertainers (magic and balloon modelling a speciality); a small soft play area and a cinema screening Battleship, a film about an alien naval battle. Screening a film about aliens at sea whilst actually at sea is either a great idea or a terrible one, but either way I salute your sense of humour, film booking dudes. I opted for traditional adult traveller entertainment and went shopping for make up and giant Toblerone instead. The onboard food choices were pretty good in that they were varied, with lots of choice for children. Even if your kids are picky, I think you’ll be able to feed them well. For a vehicle which was launched in 1992 and let’s face it, many people have probably puked up on during rougher crossings, the Normandie was all very clean and fresh – a very pleasant place to spend the six hour crossing. We all felt like our holiday had started long before we reached France. Whilst our departure was smooth at Portsmouth, every other end of the journey involved delays in getting through customs and being stuck in a slow-moving queue of cars for up to an hour. So make sure you pack plenty of in-car entertainment if you’re making a journey like this – in high season with up to 600 cars to load on and off that’s inevitably going to take time. We occupied ourselves with a combination of books, in car DVD, Nintendo DS and wondering just how many aliens there are at sea anyway. Make sure you go to the loo just before you get on or off the ferry. Trust me, it’s a necessity. In retrospect I should’ve made a packed lunch and taken more bottles of water. And possibly a shewee. So after the boat, we took to the road. To our relief, the route from Caen to Siblu’s Domaine de Kerlann in Brittany was pretty straightforward: a big road, another big road, little turn off and you’re there. Traffic was relatively light on the way out, though on the way back we were delayed in a couple of places and it took at least an hour longer. I guess a lot of people had a boat to catch. And speaking of traffic, a Mini is perfectly fine for this sort of holiday. What DO people pack in those enormous cars with roof boxes and trailers on the back? Snacks, maybe? Shewees? We’d vaguely thought that we’d stop off along the way for our tea, but the French don’t seem to do service stations, at least not on the roads we were on. No sign of Le Ginsters or Le Petit Chef at all. So we basically existed on the mints we had in the car until we thankfully found a garage to stop at on the outskirts of Rennes. And that’s my other tip for you – make sure your car is full of petrol and your family is replete with food, cos you sure as heck ain’t going to find them on the road. Oh yes, that reminds me…. What, do you want me to turn right? Ah yes, happy holiday memories. We arrived at our Siblu holiday camp at around 8:30pm, after setting off at 5am. We went for a walk to stretch our legs, get a first look at the camp, and note how the mobile homes look like they’re floating on air (apart from the bricks). At that point, the heavens opened and we were treated to our first French shower. Thoroughly drenched, we pelted back to base and listened to the rain as it pounded on the roof. I woke up in the middle of the night and the rain was still thundering down on to our mobile home. Oh no, I thought, is this how it’s going to be? We’ve come all this way and the weather is like a wet weekend in Cardiff. Find out what hapened next in the next post. 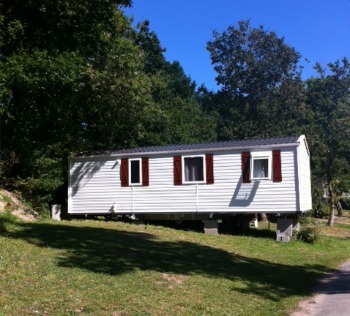 Disclosure: We travelled to France for the purposes of reviewing a Siblu holiday village. 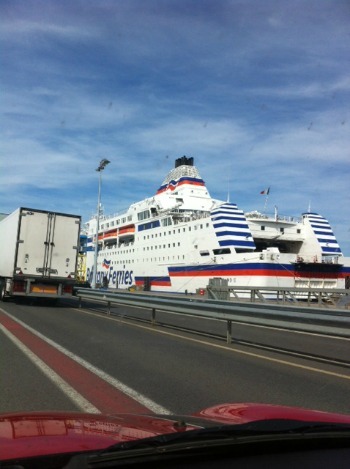 Our ferry journey was provided courtesy of Brittany Ferries and our 7 night stay in a caravan was provided by Siblu. All other expenses were met by ourselves.